The Triton AquaSafe Alarm is a warning system that alerts the end user in the event of a high level situation in the chamber/sump, or when a high level situation has been recorded, a power failure to the AquaSafe Alarm or when there is a service due. There is a battery incorporated within the panel to power the alarm in case of mains power failure. The system is designed to activate via a mini or sump float switch located inside the chamber/sump. It is set to activate higher than the activation point of the primary pump. The Triton AquaSafe Alarm is a warning system that alerts the end user in the event of a high level situation in the chamber/sump, or when a high level situation has been recorded, a power failure to the AquaSafe Alarm or when there is a service due. There is a battery incorporated within the panel to power the alarm in case of mains power failure. 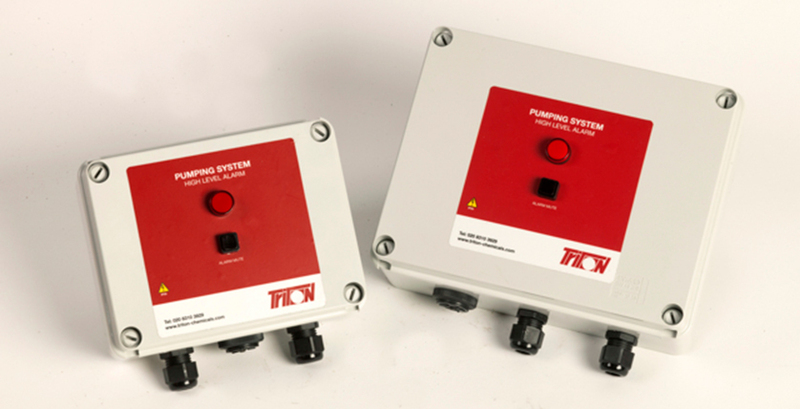 The system is designed to activate via a mini or sump float switch located inside the chamber/sump. It is set to activate higher than the activation point of the primary pump.